Geronimo was a great Native American leader. He was born in the Apache tribe in 1829 near Clifton, Arizona. Throughout his life, Geronimo gained a reputation as a leader who challenged anyone who threatened his tribe’s way of life. 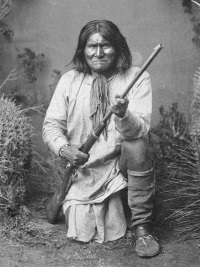 In 1850, when Geronimo was only 21-years-old, Mexican soldiers stormed the Apache tribe. Many Apache were massacred during this raid, including Geronimo’s wife, children, and mother. Geronimo wanted revenge for his family and the many other Native Americans who were killed. So, in 1882, he and his men went after Mexican commander Juan Mata Ortiz and his Mexican soldiers. Geronimo ultimately killed Mata Ortiz by burning him alive. For many years, Geronimo and his followers continued in guerrilla-like warfare against both Mexico and the United States. But, in 1870, the U.S. captured Geronimo. He and his followers were forced to live in the San Carlos reservation in the 1870s. However, Geronimo eventually escaped from this reservation. Following his escape, U.S. Generals George Cook and Nelson A. Miles attempted to find the Native American leader for half a decade. Geronimo surrendered to them in 1886. He and many of his followers were exiled first to Florida, next to Alabama, and ultimately to Fort Sill, Oklahoma Territory in 1894. For years following his exile from Arizona, Geronimo spoke at many national events to advocate for Native American peoples and their rights. He died on February 17, 1909, in Fort Still, where he was buried in the fort’s Apache cemetery. Geronimo is still known for his great courage.